The accessory rail system easily attaches to the Guardian full-face mask and makes it possible to mount various lights, cameras, and other devices to the sides of the mask. This version has the “Inodive LED Dive Light” mounted to the accessory slide. This light is rated at 1watt (80 Lumen), and will burn for approx..4 hours on 2 AA batteries. A double O-ring seal, and magnetic switch, help insure the watertight integrity of the light to 150 feet. Other devices can be attached to the accessory rail by adding additional “Universal Slides” (purchased separately). Cameras, lights, and other devices are then changed by simply sliding them on or off the rail. 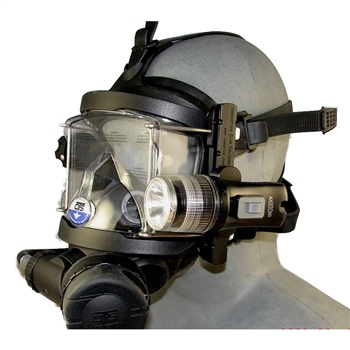 This quick-disconnect feature allows surface support to quickly exchange or replace devices as the mission dictates without removing the mask from the diver, or the diver from the water. Each Accessory Rail can accept 2 slides. Additional slides can be purchased separately. One rail may be used, or two may be mounted (one on each side). The attachment method does not interfere with commonly used surface breathing valves. The rail system is not mass produced—each one is made and assembled individually, and manufactured using quality materials.